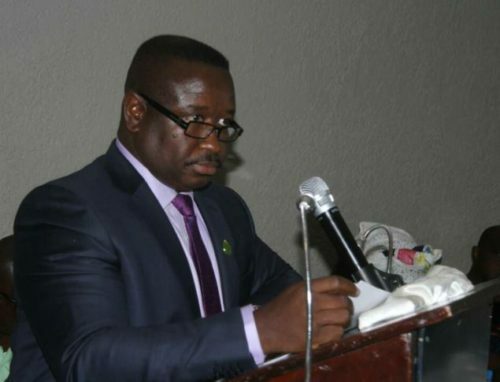 Sierra Leone’s President Julius Maada Bio has sacked all political appointees at the country’s foreign missions including ambassadors and information attachés. He has also retired all workers in the public service who have attained the age of 60, except those under special employment approved by parliament. The executive order came as parliamentarians went into fisticuffs on Wednesday after they were sworn-in. Members of Sierra Leone’s opposition All People’s Congress walked out of parliament after police escorted at least 15 of their colleagues from the chamber for disrupting proceedings. The new parliament elected Abass Bundu of the ruling Sierra Leone’s People’s Party as speaker despite the absences. He received 71 votes, less than half of the 146 members. Local AYV Television said four members of a third party abstained from voting to protest police removing elected officials from parliament. Julius Maada Bio of the Sierra Leone’s People’s Party was declared president April 4. But the loser is in court to challenge his election. Sierra Leone has an opposition-dominated parliament, but the APC party does not have an absolute majority. Sierra Leoneans would have low-key independence anniversaries since the country is reeling from a cash crunch. New president says the country has not achieved much since independence. New Sierra Leonean President Julius Maada Bio has sacked all political appointees in the country’s diplomatic missions abroad. President Bio, who has embarked on various measures to reduce government expenditure, also put a freeze on hiring of new employees and purchase of vehicles. He also challenged all Sierra Leoneans to take an inward look into the state of the nation by asking what it had achieved since independence. “During my swearing-in on April 4, 2018 as president of the Republic, I said that my election and my new administration is the dawn of a new era to change and transform Sierra Leone. As a nation, we must resolve to use this opportunity to change and transform our beloved Sierra Leone,” he stated. He said Sierra Leoneans would have low-key independence anniversaries since the country is reeling from a cash crunch. President Bio said the country that has been independent for 57 years, had empty state coffers, adding that government celebrations could only be possible when domestic revenue collection makes 20 per cent of the gross domestic product. Mr Bio assumed the presidency on April 4, after winning a hotly-contested election on March 31. Former ruling All People’s Congress (APC) party on Thursday announced a boycott of the government over the petitioning of 15 of its elected MPs. There were chaotic scenes in the House on Wednesday when APC MPs protested the removal of their colleagues who had been slammed with a High Court injunction barring them from attending the first parliamentary session in which the Speaker and Deputy Speaker were later elected. For the first time, Sierra Leone has an opposition-dominated parliament, but APC does not have an absolute majority. It believes that the move to petition its members was part of a plot by the ruling Sierra Leonean People’s Party (SLPP) to deprive it of its majority. Armed police forcibly removed the protesting MPs from parliament, leading to the hospitalisation of one of them. The opposition party’s leadership described the development as the lowest point in the country’s democratic journey and said it had ordered all its 68 elected MPs and 10 APC-controlled local councils not to cooperate with the government. Regional bloc Ecowas Parliament has condemned the violent removal of the opposition MPs from parliament.